Help! Earwigs infesting and killing all my trees! I live in Colorado and have Poplars and Aspen trees. Earwigs are taking over all of them and eating them from the inside out. How do I get rid of them and save what's left of the trees or is it too late? Re: Help! Earwigs infesting and killing all my trees! Hi Dolly and welcome to the Forum!! Can you show us some pictures of your bugs and your trees (close up of the damage and farther back to show the over-view of the trees). Did you really mean the bug is boring into the tree and chewing it from the inside? To my knowledge, earwigs can't do this. Usually they are a mixed blessing in a garden. They will eat a lot of other insects that you don't want, but, especially when present in big numbers, they will also eat seedlings and soft fruit. But established mature plants and hard fruits are supposed to be proof against them, which suggests they aren't equipped to chew up or bore into hard stuff. 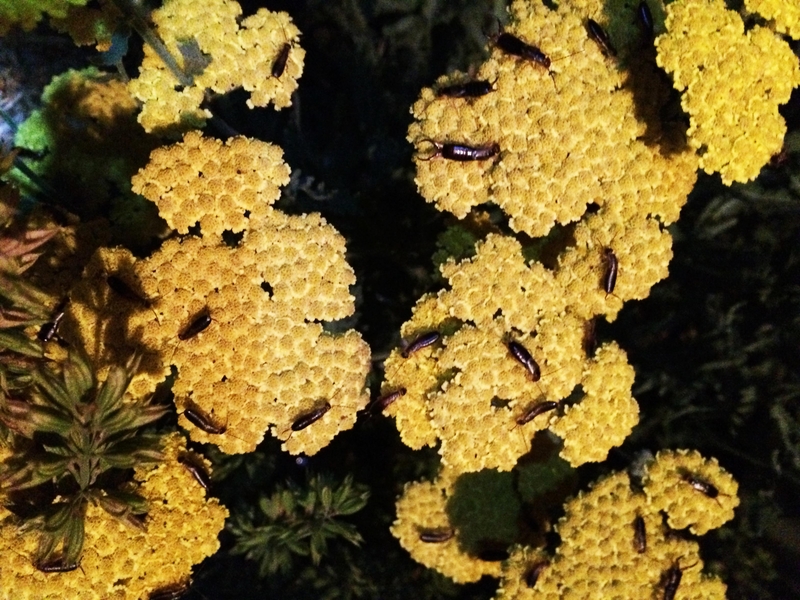 it is still close up and a bit magnified, but if you know what yarrow flowers look like, that will give you an idea. Largely off-topic but when I was a kid someone told me earwigs were called that because they could get inside your ear and eat away your brain - another thing I think they can't really do!! Since growing some corn I've figured out why, in fact, they're probably called that . But the stigma sticks and I find them creepy. Yes, the picture of the earwig is exactly what is coming out of my tree in the back yard when I take the hose to the hole and loose bark on the side of the trees. They have also bubbled up the bark at the base of the main branches. The only other critter I see around the trees are ants but not very many. All my neighbors trees are slowly dieing too. My leaves on my Holly Hocks get like that towards the bottom of the plants too. I usually clean up all the dead and bad leaves regularly and where my Holly Hocks are they get a lot of sun and its pretty dry back there. Also have some neighbors around that are not very good about keeping there yard up at all, especially the ones behind us! Our backyards meet. I can post some pictures tomorrow for you. Thanks! I'm with you, sister. Yuck. This is exactly what I'm seeing and the damage they are doing to my trees! I think rainbow was correct in the first assessment and description of earwigs. It seemed more likely that the tree is already dying and the earwigs are just taking advantage of a comfy place to live. So I searched for any info on "aspen trees dying in Colorado"
Here's a clue -- how old do you think your tree is? Nearly all aspen available for sale are collected, meaning they were dug out of the wild with little of their root system. Even after careful preparation and care, aspen still only have a life expectancy of about 25 years in the home landscape. 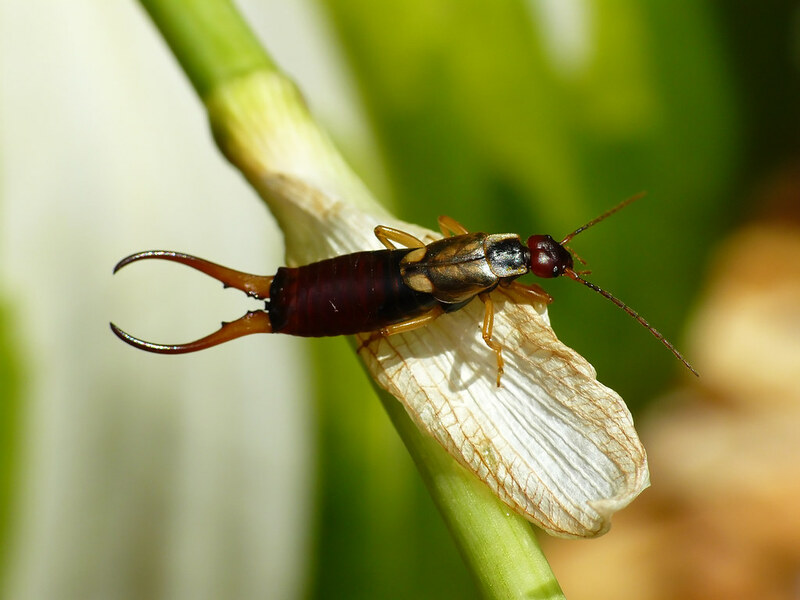 Earwigs like to hide in dark, tight-fitting areas during the day and often become nuisance problems as a result. RE: Applestar, yes, I think your right! I was looking further and found out that the Poplar I have in the backyard is also known as an Eastern Cottonwood. Not a native to Colorado and doesn't produce the annoying cotton that fly's in your face. This tree is known to get a fungus called Septoria Musiva which causes the destruction I'm seeing and those ugly earwigs are hiding out in there during the day! Unfortunately it doesn't look like there's anything that can be done about it and the fungus can spread to other areas or trees, so it looks like we will be cutting down the rest of our trees a little at a time. The one in the back got attacked by a storm we got last night and the wind took one of the tall shoots off the top. Heard it crack and down came about 25 feet on to some other branches! These were all beautiful trees when we moved in 10 years ago. Its a shame to have to lose them all. Well, we can start fresh and will plant some good disease resistant ones when the time comes. Thank you everyone for all your help and great information!! This is a 5 star forum! It sounds like you have your answer, but it's interesting how sometimes things in the garden just aren't as they appear. You see earwigs burrowed in the wood of a tree that's declining and obviously that seems like your culprit. I thought goldfinches were eating japanese beetles that were on my zinnias. Then I researched the birds and discovered they're vegetarians and were really just eating the zinnia seeds and co-existing with the beetles. Sometimes the insects I find that appear to be eating my plants are actually just hunting the insects that are really doing the damage. Always very interesting to learn something new! Vanisle_BC wrote: Largely off-topic but when I was a kid someone told me earwigs were called that because they could get inside your ear and eat away your brain - another thing I think they can't really do!! Since growing some corn I've figured out why, in fact, they're probably called that . But the stigma sticks and I find them creepy. Yes, its wonderful to learn new things and your dream would creep me out! I'm surprised I haven't had that very same dream after spraying my tree!! Ewwww!